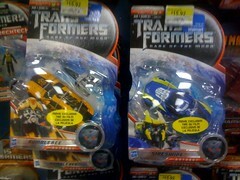 This set was out weeks ago at Markville Walmart. I caved and bought it. In all honesty I don't have any of those figures in legend size so it was fine and only $5 each....or $15 for roddy with two others free...whatever you have to tell yourself I suppose. I really only want the new head on Prime. The deco is horribly tacky. I only want this for the Rodimus as i have the BB mold already. Last edited by Mike; 06-30-2011 at 01:23 PM. Scrappin' slag, I tried that today, cashier, cashier beside her and CSM said "no" because they couldn't find the word "Mechtech" on the box. I even tried showing them the $30 reg price and Voyager status of it, and even the picture on the flyer had Optimus on it...no luck. Maybe at another Wal-mart or different cashier. I'll just add these have been sighted in Ontario. Last edited by jacobot; 07-05-2011 at 09:29 PM. Oh well. Any new sightings for that deluxe Prime? I keep checking my walmart, but no luck. Also, I grabbed that Legends 3 pack, soundwave is actually pretty cool, his head is on a balljoint, and his legs and arms are pretty posable as well. I was impressed The Hot Rod was cool too. Well, a different cashier sure helped with the price match this time.